Since October, construction set up shop in the student and counselor parking lots to remodel parts of the campus. “I really do think it’s helping the looks of our school a lot,” Assistant Principal Brad Davis said. Construction has been working on remodeling 200’s classrooms gradually throughout the school year. The workers also did a quick job on the math and foreign language hallways during winter break. The matte white tiles have now replaced the old, yellowing, walls. “I feel that the nicer the school looks, the better the students and staff will view the school,” Davis said. It has been impossible to ignore the brightness in the newly remodeled classrooms. The new ceiling lights, especially ones without covers, have no problem reflecting off of the fresh white paint on the walls. But the ‘what’ and ‘how’ parts of remodeling wasn’t entirely up to Davis. They plan to make a few more adjustments to certain classrooms once basic remodeling is completed. “Some of the rooms will have dimmer switches to help control the lighting. They’re also going to work on the air conditioning units during the summer,” Davis said. Teachers on the West side of the building temporarily relocated their classrooms across campus. After about a week, teachers have been able to move back into their refurbished rooms. There are still classrooms in line for getting a makeover within the next few weeks. 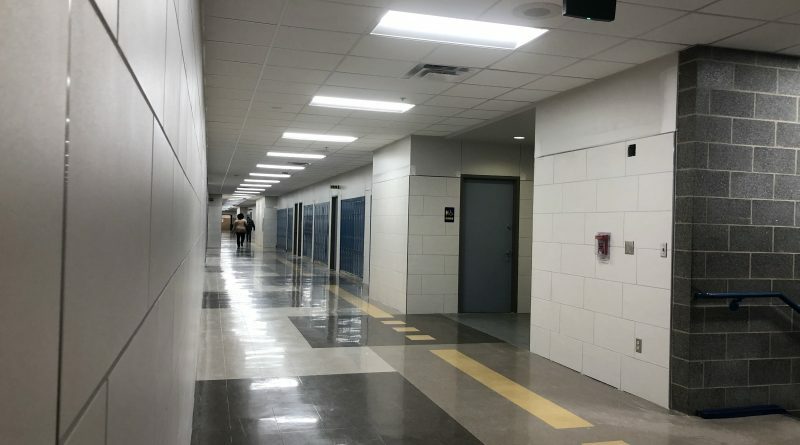 The overall remodeling has been estimated to end just before the 2019-2020 school year starts.